Rescue workers look at fellow workers searching for people under the rubble of a collapsed building after an earthquake hit Mexico City, Mexico September 19, 2017. MEXICO CITY - Rescue crews and ordinary citizens searched through rubble for survivors as night fell on Tuesday on battered cities in central Mexico, including the capital, where the death toll from a major earthquake grew to at least 226. Much of the country was also shaken when an 8.1 magnitude quake, the strongest in more than eight decades, struck southern Mexico on Sept. 7, killing at least 98 people. Volunteers continued arriving throughout the night, following calls from the civil protection agency, the Red Cross and firefighters. Banker Jesus Gonzalez Hernandez, 55, said office lamps and furniture swayed when the tremor began. He and colleagues rushed to evacuate. “But while exiting down the stairs, the walls were coming apart,” said Gonzalez Hernandez, who fractured his ankle in the chaos. At the same time as the earthquake, Mexico’s Popocatepetl volcano had a small eruption. A church collapsed during mass, killing 15 people, in Atzitzihuacan on the slopes of the volcano, Puebla Governor Jose Antonio Gali said. 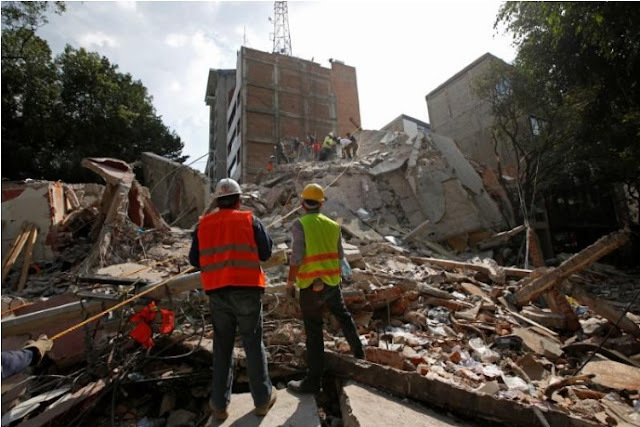 Rescue crews and ordinary citizens searched through rubble for survivors as night fell on Tuesday on battered cities in central Mexico, including the capital, where the death toll from a major earthquake grew to at least 226.